There is a nifty design idea for a visual, interactive bar counter surface. 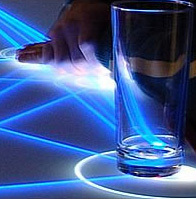 iBar – an “intelligent” surface system lights up and connects objects together in a pretty cool visual effect. Though Open Source Beer calls for an open sourced solution. 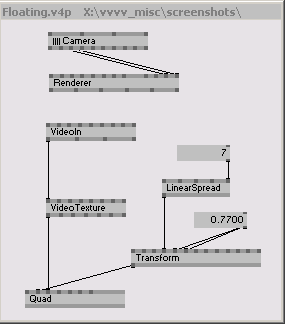 Alright, it’s not quite “open source”, but vvvv is a “multipurpose toolkit” that is free for non-commercial use. The visual programming interface (screenshot left) will hopefully make sense out of thousands of graphical objects that vvvv’s real-time system can handle simultaneously. vvvv also supports Multi-Projection setups, lots of 3D render and analysis, Physics, Video, Audio… Just take a look at all their propaganda. A couple of projectors, Infra-red cameras, and lots of sleepless nights coding the animations – is all that it takes to up the ante for visual display and interactivity. Amazing video! I just need to get a hold of all this hardware (projectors could be expensive), and start building my own interactive multi-touch surface. Some cleaver coding and nifty design could soon bring the meaning of drinking games to a whole new level. I came across your blog for the first time today and look forward to exploring it further. I blog about multi-touch applications, large screen displays and surfaces, ubiquitous computing, and off-the-desktop interaction quite frequently. This is an area that I feel has great potential, especially in areas such as health care, education, information enhanced wayfinding, and serious games. I’m interesting in universal usability factors related to systems that support this sort of interaction. If you are in Waterloo, you probably know of Celine LaTulipe, who was my HCI professor last year. She has been involved in interesting interaction research over the past several years. Feel free to look over the information and links I’ve posted. Many of my readers are computer science, educational technology, or software/information systems students, or work in related fields. I use my blogs as on-line file cabinets, so be sure to use the “search” feature to find what might be of interest.